Pete Carroll stands by his clock management in Seahawks’ defeat to the Rams. Here’s why. Be it the lack of a time out before the two-minute warning, or the controversial time out right when the Rams' punt team came out at the end, Pete Carroll said he has no second thoughts about how the team managed the clock in the final minutes of Sunday's 33-31 loss to the Rams. Seahawks coach Pete Carroll had a lot to discuss during his weekly day-after-game radio show on ESPN 710 Seattle following the 33-31 defeat Sunday against the Los Angeles Rams. Carroll explained his reasoning after the game — that he didn’t want the Rams to be able to bleed off 33 seconds before punting, leaving the Seahawks likely with just more than a minute or so to move 50 to 60 yards to get into range of a game-winning field goal. Carroll reiterated he initially called the timeout as the pile was unraveling when Todd Gurley was held to no gain on a third-and-one play that snapped with 1:52 remaining, and before a measurement to determine if Gurley had gotten the first down. The Rams initially sent their punt team on the field, but then changed course and put the offense back on the field to go for it. Asked directly if he thinks the Rams would have punted if the timeout had not been called, Carroll said yes. “They were thinking ‘punt the ball’ if we let the clock run, but when we didn’t let the clock run — I think they were content to kick and gives us a minute three and no timeouts and try to hold on to it for the win,’’ Carroll said. But the way it unfolded — with Rams quarterback Jared Goff getting 2 yards on a sneak to get the first down – didn’t have Carroll second-guessing anything. Some also wondered later if Carroll erred in not using the first of what were two available timeouts on the final possession after a Gurley run for 2 yards on first down with 2:42 remaining. The Seahawks instead let the clock run down to the two-minute warning. 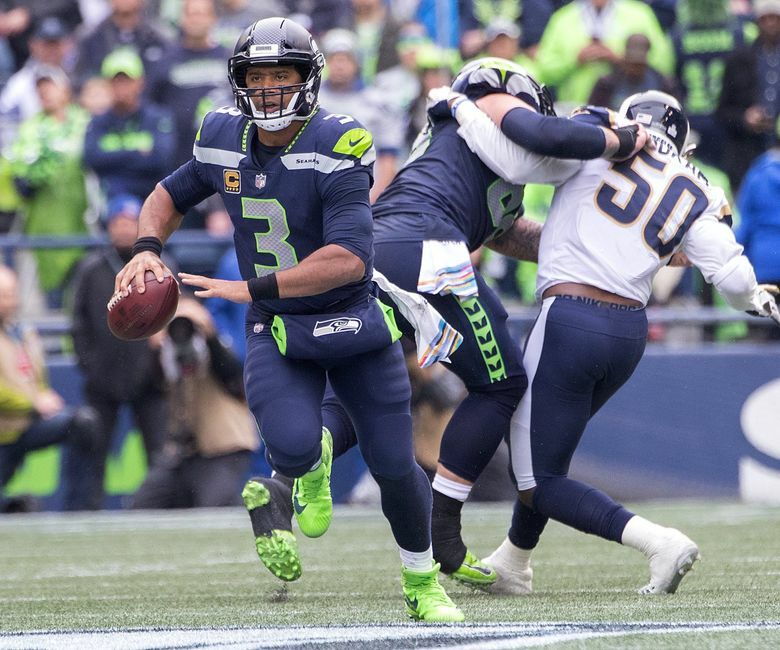 Carroll said the thinking was simple there — to force the Rams to continue to run the ball to make Seattle want to use their timeouts. If Seattle had just one timeout remaining, but the Rams had at least two plays left on the drive then Carroll said they might have been more prone to be aggressive and pass. Throughout the game, the Seahawks had more success stopping the Rams’ run than their pass. Carroll said Seattle having more use of its timeouts at that point “certainly does’’ impact what the Rams might call offensively. D.J. Fluker was called for a devastating holding penalty on Seattle’s last drive, negating a 5-yard run by Mike Davis on second-and-13 from the Rams’ 35 with 3:53 remaining. The penalty (drawn by Rams lineman Ndamukong Suh) made it second-and-23 from the Rams’ 45 and Seattle then threw two incomplete passes to stop the drive and was forced to punt with 3:38 remaining. Carroll let slip one more time his unhappiness with that call when asked about the Rams’ pass blocking. On the first down before Fluker’s penalty, Germain Ifedi was called for a false start after Russell Wilson hit Tyler Lockett for 44 yards to the Rams’ 32-yard line. The penalty made it first-and-15 at the 37. The play clock also appeared to be at zero as the ball was snapped, and Carroll said the snap was more the issue than Ifedi. Tedric Thompson was an obvious focal point as he was making his first start at free safety in place of Earl Thomas. Thompson missed a few tackles and Carroll said as much Monday. But Carroll said Thompson wasn’t the only one to blame. Wilson didn’t have a rushing attempt for the first time in his career, continuing a season when his running has been as quiet as ever — he has just 42 yards on 11 attempts. But if Wilson’s hamstring is bothering him — he’s been on the injury report each of the past three weeks though he has been a full participant in practice and has not missed a snap in a game — Carroll isn’t letting on. Instead, Carroll said the Rams were insistent on not letting Wilson run and Wilson made the right reads on zone-read plays to hand the ball off to Chris Carson and Davis, instead.